Volkswagen Pasadena has been calling me everyday. I assumed they were not-so gently reminding me to schedule my Snowball Tiguan for her 30,000 miles service appointment. It was annoying since I wasn’t due for it for a few more months and after three car leases with them, they never called me to schedule service before. After letting the calls go to voicemail several times, I finally took their call to let them know I wasn’t due for maintenance and to leave me alone. The guy told me he wanted to buy back my Tiguan. Umm, Snowball is only two years old and I was pretty sure it was just a ploy to get me down there so they can upsell me into something pricier. He assured me I wouldn’t have to pay a dime and would lower my payments. 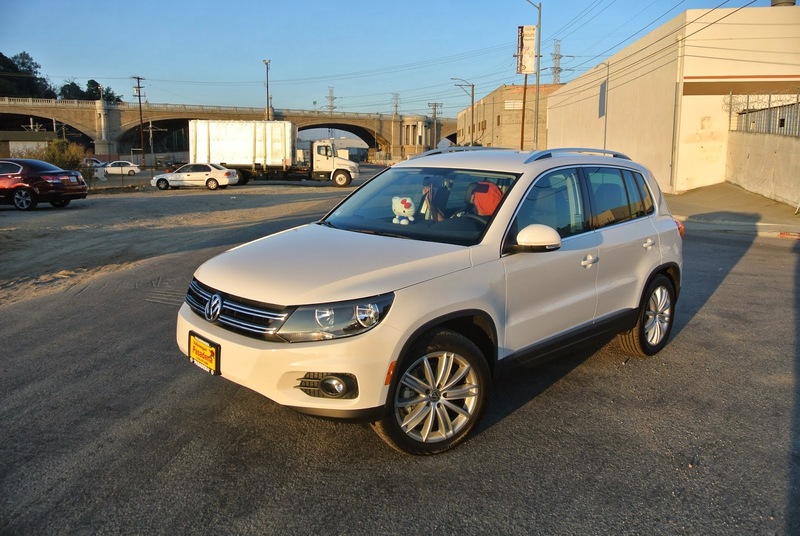 Yeah right, I’ve heard that one before but I wanted to take a look at the 2014 Tiguan model for shits and giggles. Friday night we headed over there with a cynical attitude and was pretty sure we were wasting our time. Well, 4 hours later I brought home Snowy. Yes, they did actually lower my payments and I didn’t have to put any money down. I should disclose I did pay license and registration fees but it came out to what my December payment would have been and I don’t have a payment until January, so it turned out to be no money out of my pocket. The main reason I went with the deal was I was going to be over my allocated miles in my current car which would have cost me $7,000 in two years when my lease ended. My new agreement has more mileage and a better warranty *no charge for service which saves me $1500* I am pretty impressed with the sign and drive deal. My new Snowy has satellite radio and fancy features like a rear camera and keyless ignition. I’m still getting used to pushing a button to start my car. Now I’m happy I took the leap of faith and went down there since it forced me to clean out all of my Olivia’s junk from my old car. You wanna be grossed out, look at the backseat of a car with a three year old! I really needed to throw away half the junk I kept in my old car anyway. My new Snowy has huge tires so I feel like I’m driving a monster truck. Our first family excursion in Snowy was a drive through downtown. We found parking and just made it just before sunset so we checked out the hidden *gem* park behind the Walt Disney Concert Hall. It was packed with folks taking engagement portraits, family Christmas photos and a chick who was obviously in her bright pink quinceañera dress *Liv thought she was a princess* We people-watched for awhile. We walked across the street to the Dorthy Chandler Pavilion courtyard. I love these two silly faces and my new Snowy!